Over 250 refugees were rendered homeless in fire that broke out in the wee hours on Sunday. 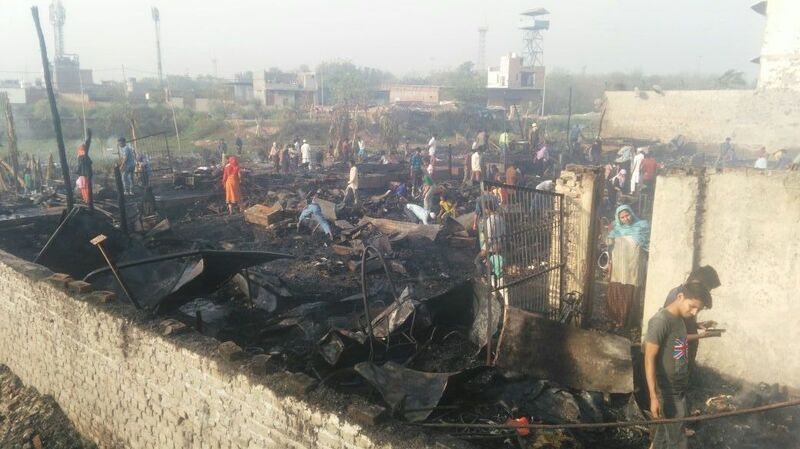 New Delhi: As many as 205 Rohingya refugees were rendered homeless when a massive fire burnt to ashes a camp they were residing in Delhi’s Madanpur Khadar area in the early hours of April 15. According to Abu Johar, a resident of the camp, situated in South East district of Delhi, the fire was first noticed around 3 am from near the area where the camp’s makeshift toilet was placed. “We were all sleeping and rushed out of our tents on seeing the fire. Since many of the tents are made of tarpaulin and have plastic coverings, the fire spread fast. Also, some of the houses had gas cylinders that burst, adding to the enormity of the fire,” Johar told The Wire. Residents of the camps said they lost everything in the massive fire. “All our belongings are lost. We couldn’t save anything, only our lives. Some people have got minor injuries while fleeing the site. Since we have no bank accounts, we used to keep whatever savings we could make from our daily work in our tents. Most of us lost those savings too,” said a resident. On seeing the fire, Johar, a student of political science from the distance learning department of Delhi University, called the Jaitpur police station at 3:10 am. “In five minutes a team arrived at the site and have since been there. They are co-operating with the victims. It was the police which called the fire engines. The fire brigade arrived at 3:55 am and continued to douse the fire till 7:40 am. When UN representatives visited the camp this past January, Johar and some others expressed their apprehension about losing their identity “if a big fire takes place.” Thereafter, five fire extinguishers were given to the camp. “But they proved ineffective in dousing this massive fire, Johar added. “We don’t know who burnt it (the camp), but we blame organisations like UN who have been coming for about two years and ask us what do we fear. We have told them, there is lack of space and we have been building huts over huts because we don’t have space. In a 10-12 feet house, as many as eight to 10 people are living. We make these shelters with bamboo that can catch fire and can burn the entire camp rapidly. We have told them about the risks but they don’t do anything to help us. Why do they ask us then?” demands Mohammad Jauhar who has been living in the camp for about four years. The camp is also home to Mohammad Salimullah and Mohammad Shaqir, the two petitioners in the Supreme Court seeking education and healthcare on the lines of Sri Lankan Tamil refugees given such families in Tamil Nadu. This past January, during the hearing of the case, additional solicitor general Tushar Mehta, appearing on behalf of the government, pleaded that the issue regarding deportation of the Rohingyas be better left to be decided diplomatically by the Executive. Mehta said the government could not allow the country to be flooded by allowing anybody to enter it. “Don’t want India to become a refugee capital,” he reportedly told the apex court. However, the National Human Rights Commission, through its lawyer Gopal Subramanium, told the court that the refugees had the right to approach the court for securing their basic rights such as education and the court should hear them. This past April 9, the apex court asked the Centre to file a comprehensive status report within three weeks on basic amenities provided in three Rohingya camps located in Mewat, Faridabad and the one that caught fire in Delhi.